In this week's episode; Jimmy, Jason, and Jessica discuss the newest celeb to face sexual assault allegations, Aziz Ansari, as well as discuss the topic in general. Next, they discuss their recent trip to the PAX South convention. Lastly, they discuss the Laundry Pod Challange and use it to bring up some of their own childhood hijinks. Enjoy! In this week's episode, the Totpod crew are granted their wildest, yet mostly realistic, wishes. They discuss the outcome of this year's National Novel Writing Month. Also, they imagine a world without net neutrality. Other topics include: Lucid dreaming, Job Simulator, Driving, Medicine, Digital Currency, and so much more. Enjoy! 182 – Smash. Bash. Trash. In this week's episode, Jimmy, Jason, and Jessica, because of the upcoming Rampage movie, discuss video game movies - past, present and future. Other topics include: The Punisher, Justice League, It's Always in Philadelphia, Coco, Net Neutrality, NaNoWriMo, and everything in between. Enjoy! In this week's episode; Jimmy, Jason and Jessica answer the age-old question - what froots your loop? They also discuss a variety of treats, ranging from sweet cookie-based cereal to fickle macaroons; the internet, from cyber-bullying to passwords; and lastly they review Wonder Woman (Spoiler Warning). enjoy! 164 – Holy Repercussions, Batman! 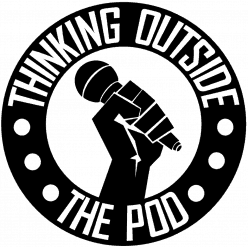 In this week's episode of Thinking Outside The Pod; Jimmy, Jason, and Jessica gather to discuss time travel, Wonder Woman (Spoiler Free), Adam West, and everything in between. Tangents include Lottery, Previous and upcoming superhero movies, Star Trek, Fictional genitalia, and so much more! Correction: Burt Ward (Robin) is actually the one who gave fans the "Ultimate Autograph", however Batman did sometimes watch... Again, sorry to bring this up at all. Jimmy, Jason, Jessica, and David gather to discuss current events and contemplate the answers to some of life's most important questions. In this week's episode, they discuss Mortality, Guardians of the Galaxy Vol. 2 (No Spoilers), and video games. In this week's episode, Jimmy, Jason, and Jessica sit down and have a conversation. First, they discuss their opinion on traveling and share some of their past journeys. Next, they discuss some of the weirder food products that they have come across. Lastly, they try some miracle fruit tablets and drink vinegar. In this week's episode, Jimmy, Jason, and Jessica gather for a frank and honest conversation about Mass Effect: Andromeda, Childhood, and San Antonio Sports. Tangents include: Old Videos, Power Rangers, Mister Rogers, Technology, Movies, Economics, Predicting Future Scandals, Egotism, GoFundMe, Fame, Our voices, and so much more. First Podcast of 2017! In this episode, Jimmy, Jason, and David discuss our past resolutions and some of our resolutions for the new year. However, as always, we have many tangential conversations including: Ronda Rousey; MMA; Movies like Wanted, Grand Budapest Hotel, Warrior, The Taken series, Captain Fantastic, and Star Wars; Books and Movies based on books; Video Games; and so much more.